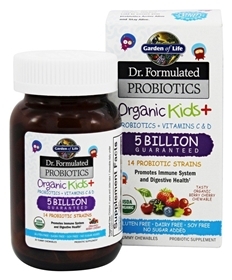 Dr. Perlmutter created this unique Immune System and Digestive Support formula especially for kids. Each chewable is Certified USDA Organic, tastes great and has no added sugar.† It also contains vitamin C from Organic Amla (30mg), vitamin D (400IU) and prebiotic fiber to help maintain a healthy immune system.† Organic matters, too. That means it’s grown without toxic pesticides, antibiotics, hormones and no genetic engineering.